Hello Tycoons, and welcome to our Easter Update! We’re bringing out the pastels and Easter Eggs to add some springtime cheer to your park! 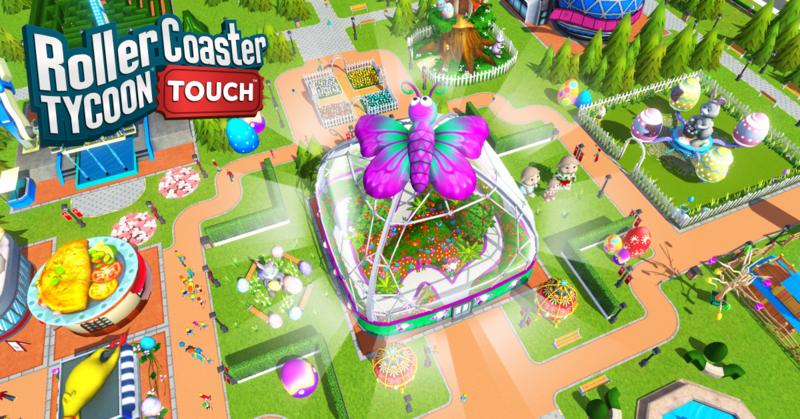 Easter also comes with a new park hub and surroundings, Easter rides, a brand-new LEGENDARY BUILDING, some new changes to the Water Park and Seasonal Events, and more! Read on for a full list of updates. Easter is here! Chocolate and Easter Eggs are everywhere! Find, collect and upgrade 31 new Easter-themed cards before the end of the Season. Easter Cards include: 1 ride, 1 shop, 1 food stand, the Bunny entertainer, 3 colors, 9 decorations, and Easter-themed trains and stations. Collect all 9 Easter decorations before the end of the season to unlock the Easter fence. Season Event Re-balance: Seasonal Card drop rate is consistent over all player levels, and total amount of upgrades to complete Seasonal Event is reduced. New Legendary building – The Butterfly Garden! This fun family ride has PERMANENT durability. No more breakdowns! New Scenario – Mini Coaster Canopy! Thrill your peeps, but don’t waste their time. Build coasters with short in lengths but high in excitement.